This post was written by peterjmurray on June 14th, 2017 5:45 pm Comments Off on SCABBAJACK INVADES ROUGHWOOD! so many wonderful letters back in April and I’ve only just got round to reading them. I’ve been so busy charging around schools all over the place, and that’s my only excuse. On a positive note, the letters were brilliantly written and a real credit to the teaching in the school. I hope you like the pic of me holding all your letters and artwork outside my secret office somewhere in deepest Rotherham. You can even see the Scabbajack boy lurking behind me! What I loved about your letters was the way you had remembered all the exciting bits of my story and how they’d scared you, but you couldn’t wait to read on and find out how things turned out. That makes me as an author really proud. After all, my job is to build the suspense and intrigue and keep you reading on and turning the pages! Lots of you said you would like to meet me, so I’m going to get in touch with a friend of mine at your school; I’m sure you know him – Mr Cadman – and ask if I can come along to Roughwood as soon as possible. I love being back at Kimberworth Park – after all, I was born and brought up there. Does anyone know Leybourne Road? Well that’s all for now. Thank you again for writing to me – I read EVERY letter and admired EVERY piece of artwork. Hope you enjoyed the end of Scabbajack and can’t wait to see you all and tell you about the next new book. Keep on reading and keep on writing and I’ll keep on writing more and more scary books! As one of you said to me in your letter, ‘Scabbajack gave me nightmares for a few nights, but it was worth it…I loved the book and can’t wait to read more!’ Brilliant! Before our three visits in the week ahead to new schools (to us!) in nearby Bracknell, Kath and I spent a Sunday in Salisbury. Not what you might regard as a spooky place to get new ideas for scary books! But then you’d be wrong! After wandering around this beautiful, historic city, we called into the stunning cathedral to have a look round. Suddenly…my sixth sense told me I was being watched! Sinister figures watching over us! 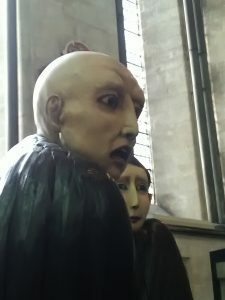 The display of sinister watching figures over on one side of the vast cathedral space was awesome! I half expected to see them turn their heads as Kath and I crept past! Cathedrals and old churches always leave me with a strange mix of feelings…peaceful, timeless, sometimes definitely spooky and occasionally an inspiration for one of my books. Those fans of mine who have read Bonebreaker, will be familiar with the line drawing of the three skeletons and three knights having a conversation – taken from an ancient wall mural in a church within the deepest Norfolk marshes. I will never forget the impact that image made on my imagination. The next day found us relaxing again in readiness for the first trip to Bracknell, a little-known town to us, despite it being relatively close to our Berkshire base. 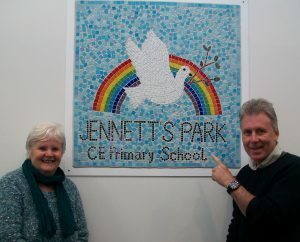 The school in question was Jennett’s Park, within a fairly new development and only six years old. One of the Deputy Headteachers, Carla, knows us from our visits to her previous school in Newbury, and had no worries about the impact we would have on our new audience. We covered two of our books – Bonebreaker and Ten O’ Clock Caller and both books went down a storm. 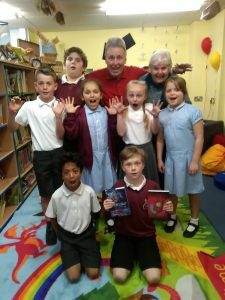 Several of the children even dressed up as Saxons and were attacked by the imposing figure of the huge Viking warrior, Sigard – ‘Even his own live in fear of him.’ We returned the next day to do a ‘huge’ book-signing and it seems that the whole of this school community are now burying their heads into our scary narratives...brilliant. We have also learnt that since our visit, the children are desperate to write their own stories, and to hear this always makes our visits so much more worthwhile. MASSIVE thanks to Joy, Carla, David and all of the staff and pupils for giving us such a fab welcome. We can’t wait to be back…see you all soon. greet us and we soon got the idea that this school is determined to become one of the best! The children were extra polite and friendly and had us a cup of tea, set up and all ready to go with our presentation within minutes. We performed the Bonebreaker presentation in the first half and some of the children joined me on stage and acted the parts brilliantly. In the second half we wowed our fab audience with spooky tales from my Ten O’ Clock Caller collection. It was a lovely experience for Kath and I to work with Mrs Coxell and her staff and hopefully we have already helped to make a difference in raising the enthusiasm of the Fox Hill pupils to read and write their own stories. We look forward to returning next academic year to wow them again with our Mokee Joe Finale Tour. Have a lovely summer everyone!